1-COLOR to FULL COLOR BUSINESS CARDS!! 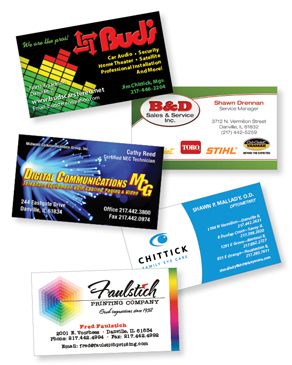 If you need a business card, make sure it makes a great first impression! Faulstich Printing can customize your cards to set yourself apart from the competition. Whether you choose a simple, 1-color design or an elaborate full-color, UV coated business card, we can help choose a design that makes your card stand out from the pile!